I just finished reading J. D. Vance’s memoir, Hillbilly Elegy. I don’t feel like adding to the torrent of instanalysis of the “white working class,” however, so I’ll just comment on the description of Yale Law School — which, in the book, serves the dramatic function of introducing the author to the Elite. There are a few details that seem unfamiliar to me — I can’t recall attending a single one of the “cocktail receptions and banquets” that Vance describes as the school’s social rituals — but then again I was thirty-nine and married with a child when I started law school. But there is one thing that Vance nails: the culture of credentialism. 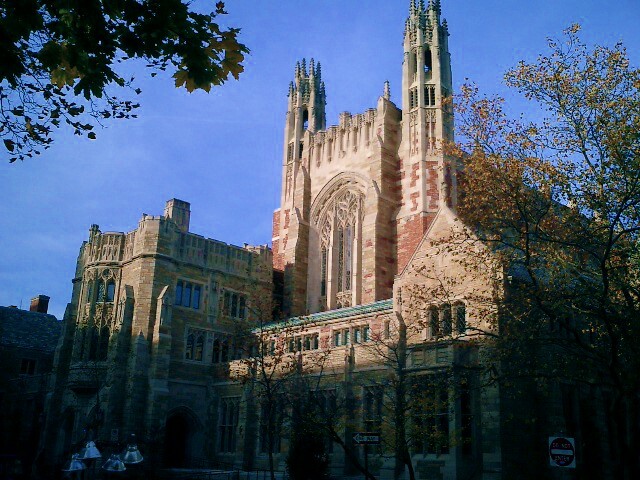 Yale Law School is undeniably an elite institution, the undisputed number one school in a field that is intensely (and toxically) hierarchical. Also, because it is a law school — as opposed to other elite institutions such as West Point or the UConn women’s basketball team — it is filled with people who have never had any idea of what they wanted to do other than be successful and gain access to the best opportunities out there. One of the curious things about Yale is that it is impossible to compete over grades; the first semester is pass/fail, and for reasons not worth going into the grading scheme is essentially meaningless after that point. I thought this was wonderful, but I’m sure at least some of my classmates experienced it as a disappointment. So what do you do if you’ve spent your life trying to prove that you’re smarter than other people? Some people use their newfound freedom to do truly great things: the Iraqi Refugee Assistance Project (now International Refugee Assistance Project), for example, was founded by a few students in the class before me. Many others pour themselves into clinics that make a huge difference in people’s lives. (The challenge to the Connecticut public school system that recently won in the trial court began in a Yale clinic.) I wrote a book. This is like a mind-altering drug for those twenty-somethings whose modus operandi is to accumulate badges of excellence that will open as many doors as possible. Most students come to law school with little interest in 35,000-word legal theory articles (and no interest in editing and cite-checking those articles, which is mainly what law review editors do), yet come springtime they become intensely interested in the pathologically stupid citation formatting, or “Bluebooking” test (what Vance calls “the most important test of our first year”) that represents the first step toward Journal membership. The same goes for clerkships. I should point out that my friends who did clerkships — doing research and writing for a judge — generally thought they were a good experience (as opposed to the Journal). But that’s not why most Yale law students want them, at least not at first. It’s because they are the closest thing to graduating with honors, given that Yale doesn’t give honors at graduation. And because there are hierarchies among clerkships — appellate courts beat district courts, and within each level famous judges beat less-famous judges — a clerkship is the closest thing you can get to class rank at a school that has no class rank (or GPA, for that matter). Vance admits trying to get a clerkship with a “high-powered federal judge with deep connections to multiple Supreme Court justices” until his primary recommender — you have to have one of these to get a top-shelf clerkship, so the intermediate thing people compete for is relationships with well-connected professors — pointed out that he was doing it solely for the credential. He pulled out and got a less-prestigious clerkship where he could be close to his girlfriend. Good for him. As you may have guessed, I didn’t apply to the Journal or to any judges. But that was because I had a family, and I didn’t want to spend any more evenings away from them to do cite checking. I also had a career and enough accomplishments behind me that I was emotionally secure enough not to pursue credentials for their own sake. But if I had been single and in my twenties, I’m sure I would have played the game. That’s what our educational system teaches smart young people: that there are universal, objective markers of achievement and ability, and that’s what you’re supposed to get. At the end of my first year, I wrote an email to the school’s mailing list proposing that the Journal simply be opened to everyone. My basic point was that the Journal competition was an unnecessary zero-sum contest that existed solely for the purpose of having a something to compete over. If I recall correctly, the public email responses were in favor by a large margin. But the Journal gets to make its own rules, so nothing changed. As things go, whether Yale Law School 1Ls waste dozens of hours immersing themselves in the stupidest citation system known to man (“the acme of absurdity in legal expression,” says Judge Richard Posner in Divergent Paths*) is decidedly trivial. But the broader problem of credentialism is real. For one thing, the pursuit of brass rings because they are shiny creates unnecessary stress and unhappiness. More generally, when you give out prizes based on idiosyncratic criteria, ambitious people adjust their behavior to excel at those criteria — which may not be particularly valuable in the real world. Then there’s the cost to society. A world in which success means Rhodes/Teach for America/Goldman/McKinsey followed by Yale Law School/Harvard Business School followed by Blackstone/Bridgewater/Facebook is one in which too many talented, well-intentioned people follow the same path and end up doing the same few things. (Since I graduated from college a quarter-century ago, the only real additions to the hierarchy have been TFA and the technology behemoths.) In their famous paper, Kevin Murphy, Andrei Shleifer, and Robert Vishny found that countries with more engineering majors tend to grow faster and those with more law students tend to grow slower. A society in which smart, hard-working young people with generic ambitions tend to become hedge fund and private equity fund managers, management consultants, corporate lawyers, and strategists for technology monopolies is probably not one that is allocating talent effectively. The reasons for credentialism go beyond any easy cure. One is the innate (personal) conservatism of people who play by the rules and excel at school. One is the high degree of inequality in contemporary society, which inflates the costs of not landing at the top end of the income distribution. One is the homogenization of culture, which means that most smart young people in the United States grow up in the same informational environment, evaluating the same set of options. Finally, for the most part, credentialism is individually rational: it’s “work for Goldman now, save the world later.” But after too many years in that environment, people come to believe that working for Goldman is saving the world (I believe the phrase is “doing God’s work“). And that’s where credentialism can lead you. James Kwak is the author of Economism: Bad Economics and the Rise of Inequality, available on January 10. He is a professor of law at the University of Connecticut, the vice chair of the Southern Center for Human Rights, and a co-author of 13 Bankers and White House Burning. He previously worked at McKinsey, Ariba, and Guidewire Software. Find more at Twitter, Facebook, Medium, The Baseline Scenario, The Atlantic, or jameskwak.net. Books: Economism: Bad Economics and the Rise of Inequality, 13 Bankers, White House Burning. @UConnLaw, @southerncenter, @Guidewire_PandC.